Hosting a French night called for some new and interesting French recipes to try out. 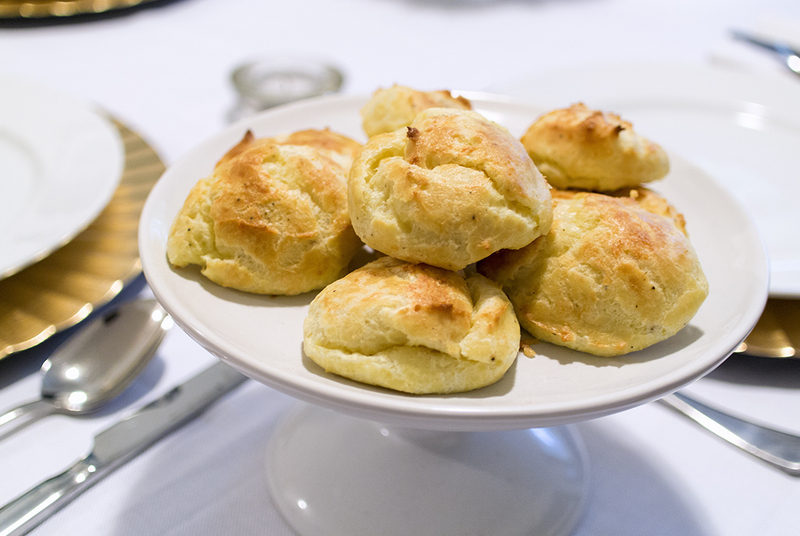 Gougères seemed like a perfect place to start–cheesy puffs to nibble on to get the evening started. These round little cheesy darlings originate from Burgundy and use pâte à choux, which is the same kind of dough commonly used in profiteroles and eclairs. Preheat the oven to 400°F. Line 2 baking sheets with parchment paper. In a medium saucepan, combine the water, milk, butter and salt and bring to a boil. Add the flour and stir it in with a wooden spoon until a smooth dough forms; stir over low heat until it dries out and pulls away from the pan, about 2 minutes. Scrape the dough into a bowl; let cool for 1 minute. Beat the eggs into the dough, 1 at a time, beating thoroughly between each one. When making the choux pastry, it is important to be sure that each egg is fully incorporated into the batter before adding the next. Don’t worry if the batter separates and looks curdled at first. Keep beating, and it will come together nicely. Add the cheese and a pinch each of pepper and nutmeg. Transfer the dough to a pastry bag fitted with a ½” round tip (or use an ice cream scoop) and pipe tablespoon-size mounds onto the baking sheets, 2 inches apart. Sprinkle with cheese and bake for 22 minutes, or until puffed and golden brown. Serve hot, or let cool and refrigerate or freeze. Reheat in a 350° oven until piping hot. A few notes on preparation: They ended up making about 21 gougères. They also took about 16 minutes to bake in our oven. These turned out to be absolutely delightful! The deliciousness of the Gruyère cheese really makes the dish. It was a light, fluffy pastry with a wonderful savoury flavour. As I was making it, D noted that it looked like I was making pâte à choux, which was in fact correct! He was pleased about this because one of his favourite things to eat at the French bakery he used to work at was chouquettes, which are basically the sweet version of gougères. Now that I know how relatively straightforward it is to make these, I’ll have to give those a try as well!